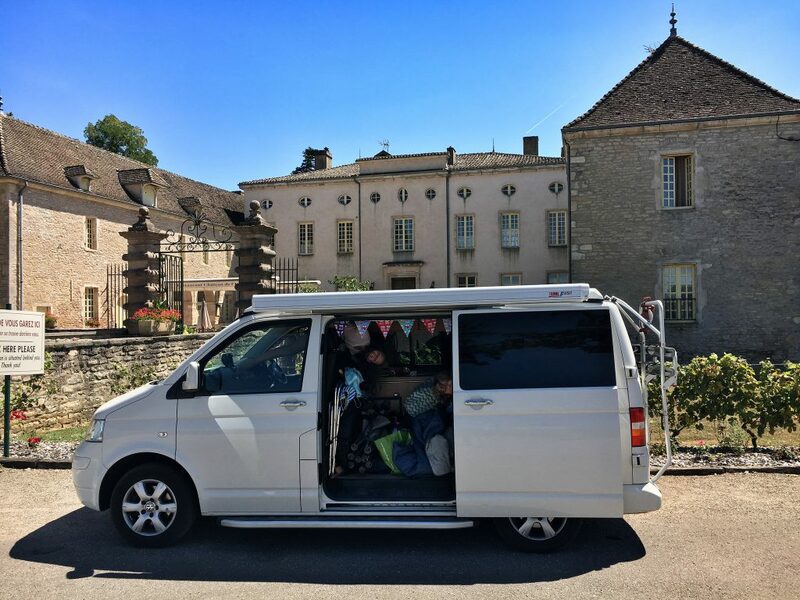 Well, we only went and did it again – over two thousands miles through France on another epic campervan road trip. I’ll list out the stops below with a few notes and photos for each place to help anyone looking to do a similar trip. 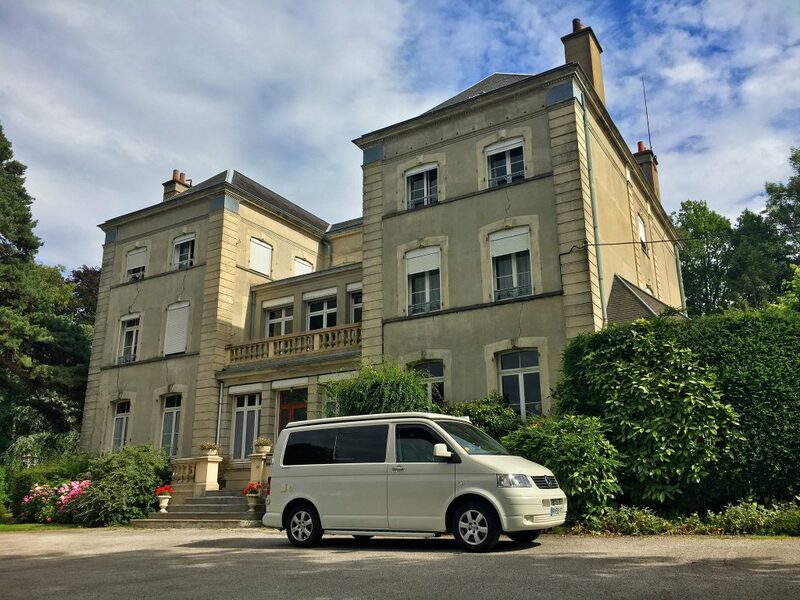 If you are thinking of driving to the South of France (from the UK) and you’ve found this post on Google, check out the other links at the bottom that detail trips in previous years. 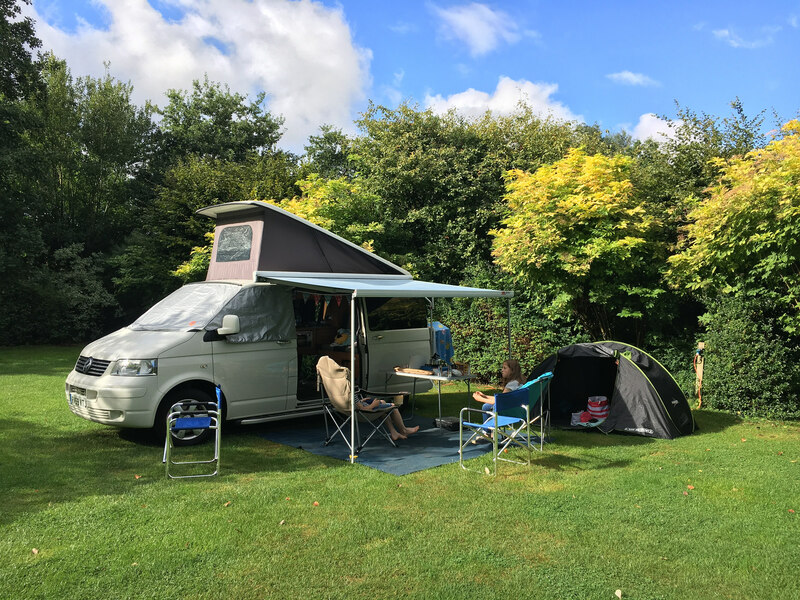 We start our route planning by creating a Google map, researching campsites and use the Caravan and Motorhome Club to book most of the sites and the Eurotunnel. They make the booking process easier, and there is a certain standard that the Caravan and Motorhome Club insist on. 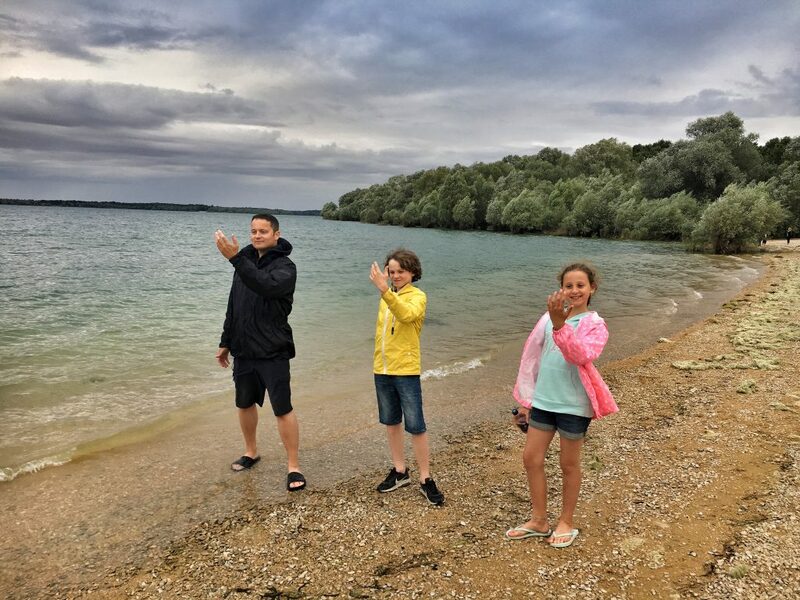 As a family of four with two children just under the teenage years we feel safer knowing we have the backing of the club when on our travels and have put that backing to the test in the past. We knew we didn’t really want to do more than four hours of driving in any one day so we selected campsites based on distance. The map shows the route and the sites we selected – if it’s not showing the embed, here’s a direct link to the full roadtrip map. We find it a good idea to use street view to check the entrance to the site and ensure the GPS is correct, one year we turned up on the wrong side of a train track. It was the start of the kids school holidays so unfortunately it’s one of the busiest times of year for the tunnel. We drove in, parked up and got a picnic out of the campervan fridge while watching for our letter to appear on the screens. A couple of hours after arriving we were on the train. After the long slow traffic filled drive through the UK we always decide to stop close(ish) to the terminal. The kids can jump straight in the pool and we can settle down to a few beers after the drive. 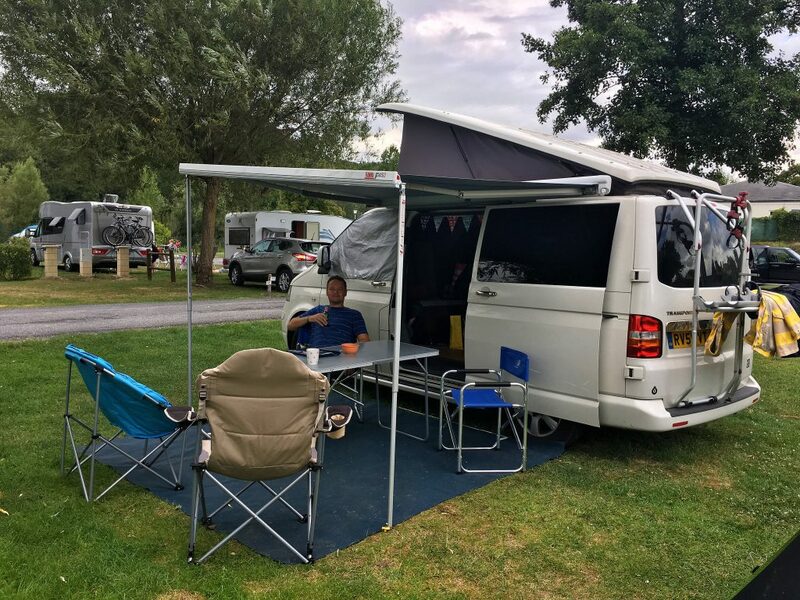 Setting up the campervan takes no time with the new Fiamma wind out awning and pop-up equipment tent to empty the van into. 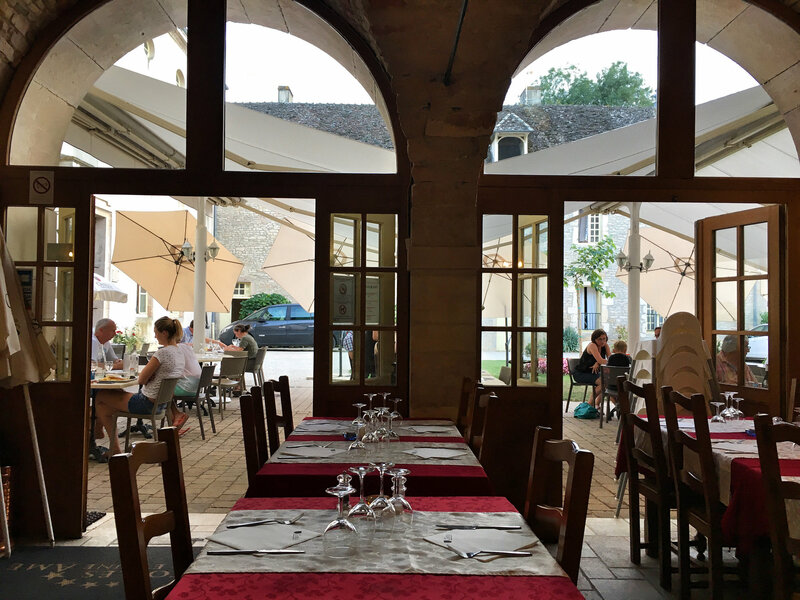 We had a nice meal in the restaurant on the site at Camping Château du Gandspette and had a few chats with the mostly English travelers either starting or just finishing their journeys. Croissants for breakfast (of course) and a leisurely packup sees us driving off the pitch at about 10am. Stopping for lunch at an Aire utilising the baguette purchased at the previous site is the daily ritual for the next few days of travel. 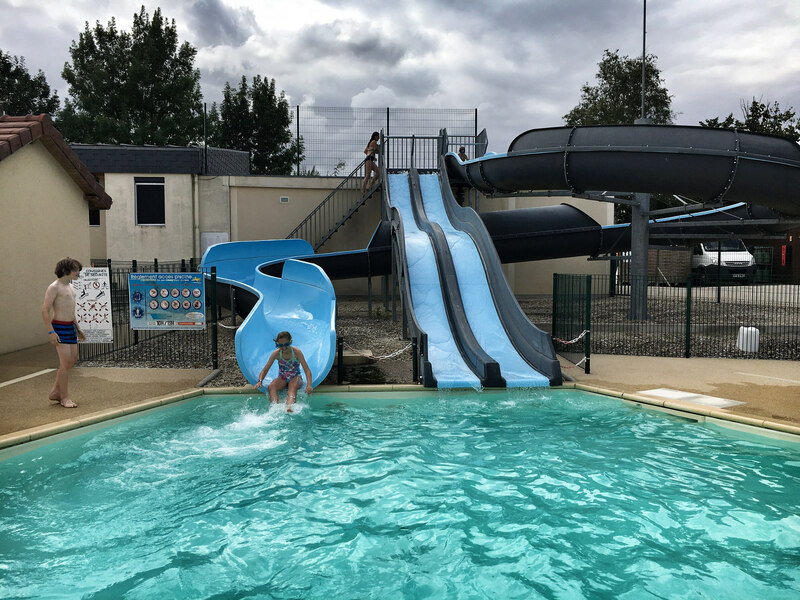 Camping Lac d’Orient is part of the same chain as the previous and featured the same bouncy fun ball type things for children. Luckily for our children our pitch was right next to the noisy bouncy thing, not so lucky for us. As soon as we get setup the kids make the most of the pool. This inland campsite was beside a lake with a beach. Can you guess what video game we’re replicating here? The usual croissant and baguette ritual takes place again and we arrive at Camping Le Bontemps. Rain didn’t stop play and the kids had the “short free” pool to themselves. We found it interesting that even after travelling 700 miles south we still hadn’t found the sun (yet). Three hundred miles further and we’d need another sea crossing if we wanted to drive any further south. 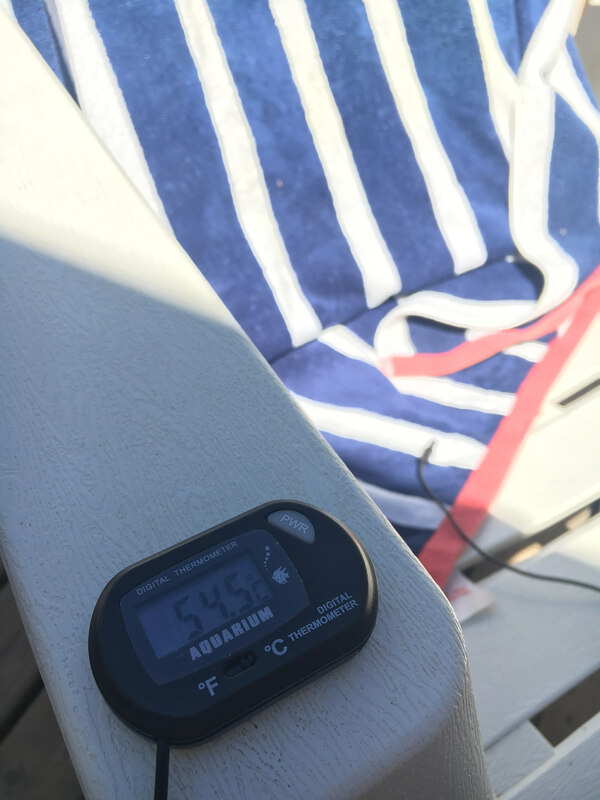 It couldn’t be any more different – suddenly it was HOT. The French Riviera (or Côte d’Azur) with Saint-Tropez and Cannes in our sights. We booked Domaine des Naiades with Eurocamp and had booked 10 nights in a static caravan with air conditioning. 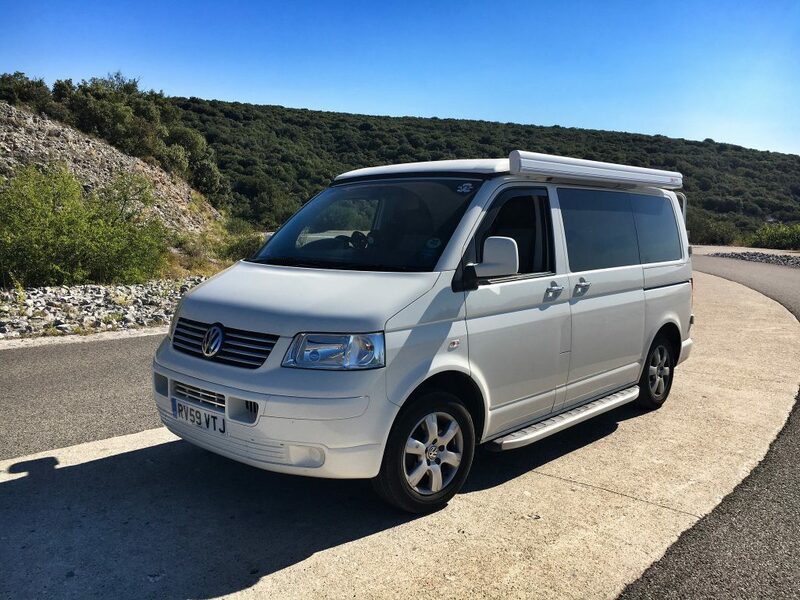 The campervan is great for getting us to our destination with a few overnight stops but it’s not where we want to spend 10 nights of our holiday. at 40 °C in the shade, things were really starting to hot up and we were right in the middle of the Forest fires in France July 2017. Luckily, although we could smell smoke and occasionally see ash dropping from the sky, the fires didn’t affect us. Our thoughts were with everyone affected and the total wildlife devastation the fires were causing. 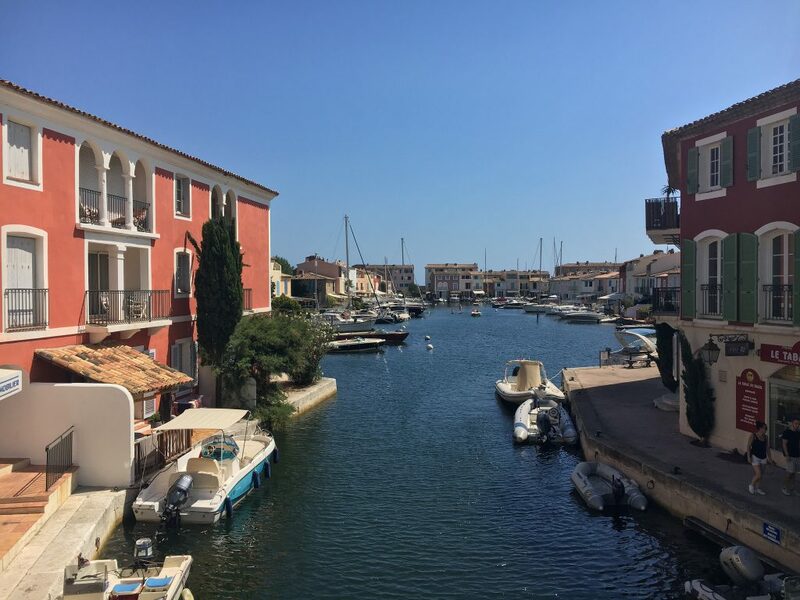 Port Grimaud is within walking distance of the site. The beach is about a mile walk but the campsite runs a free shuttle bus if you’re feeling tired. There’s also a restaurant situated on the sand. 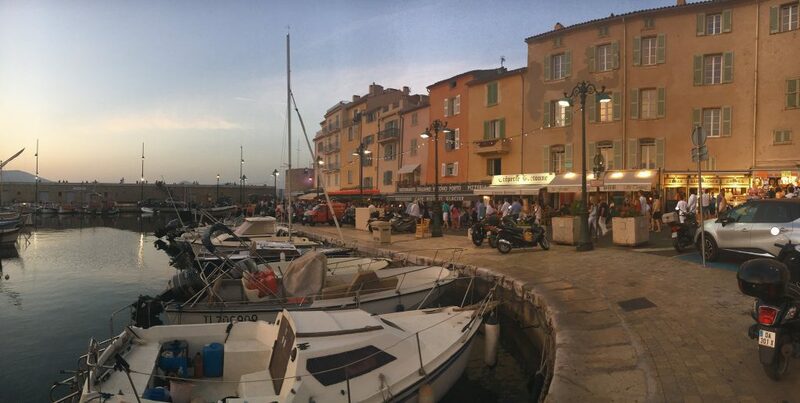 Saint-Tropez is a short 10 minute drive away – pretty boats and pretty people that mostly come out at night. It’s worth experiencing both day and night in Saint-Tropez. Our days were packed with the beach, the pool and many French restaurants where sometimes a pint of beer cost 10 Euros. It’s not a cheap place to visit but it’s good to see the culture of the French Riviera. Making our way back North we stopped in the Ardeche. Such a stunning place and amazingly even hotter than Saint-Tropez. 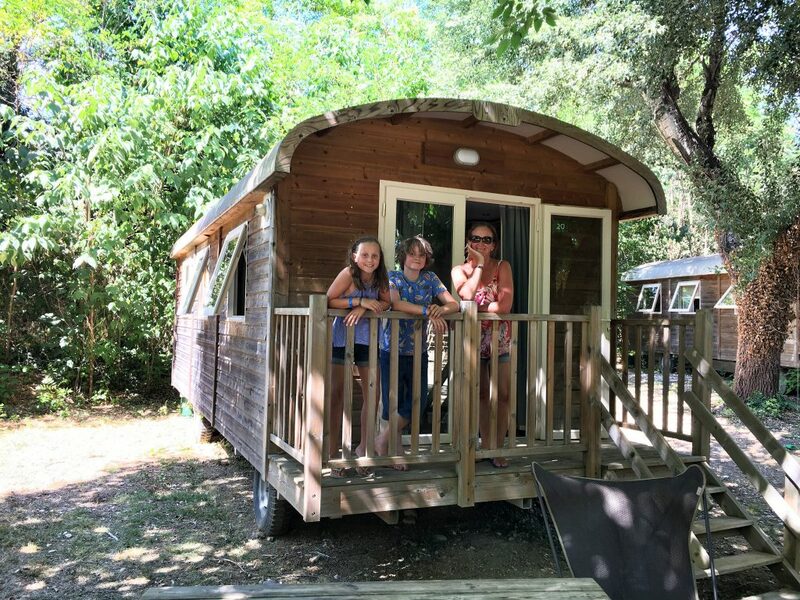 We booked direct with Huttopia on a campsite we have been to on a previous roadtrip called Huttopia Le Moulin – this time we had three nights in a Roulotte. 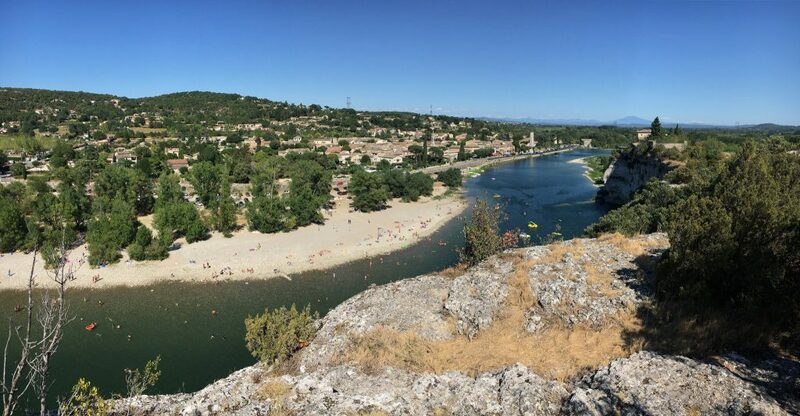 The site is based next to the River Ardèche and a quick drive through the Gorges de l’Ardèche will literally take your breath away. 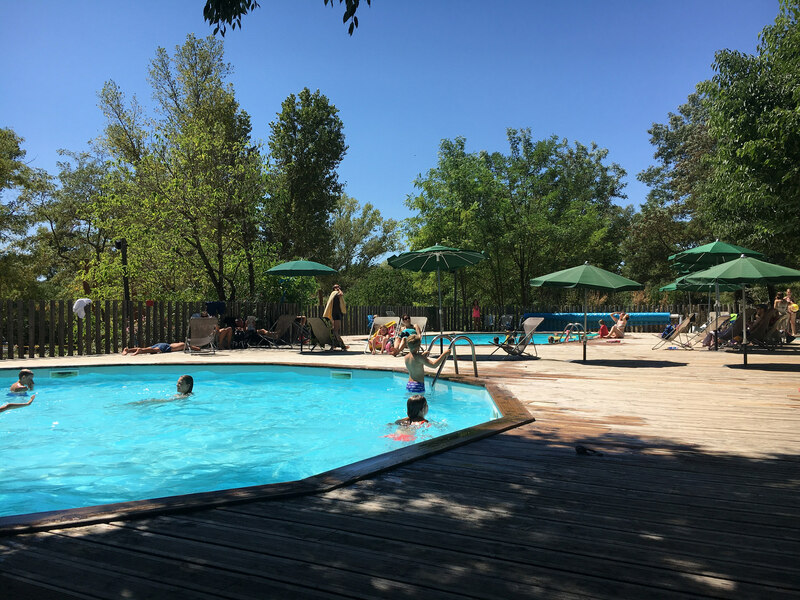 Within walking distance of the campsite, Aiguèze is a picturesque medieval village overlooking the entrance to the Ardèche gorges. 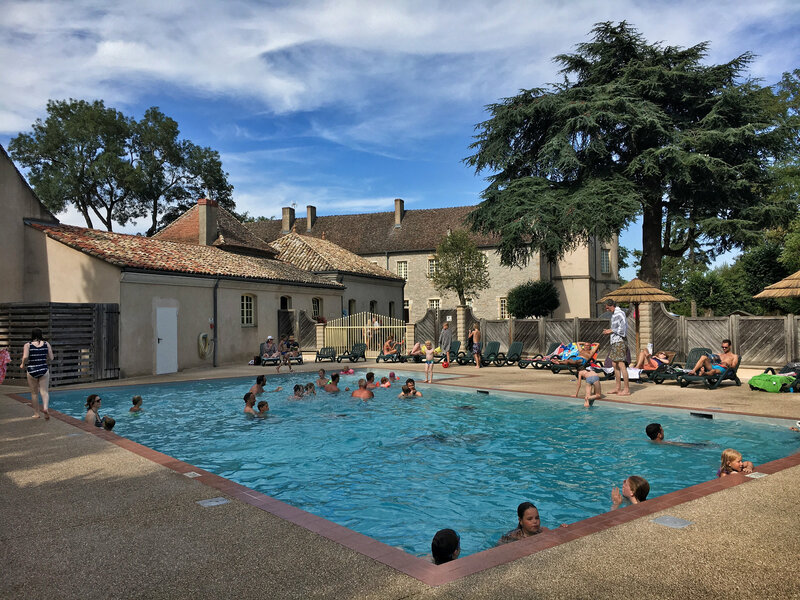 Domaine du Château de l’Epervière is found in the heart of Southern Burgundy. The campsite has spacious pitches based in a 25 acre wooded estate around the castle and fishing pond. Book the on-site restaurant as soon as you arrive (or before if possible). 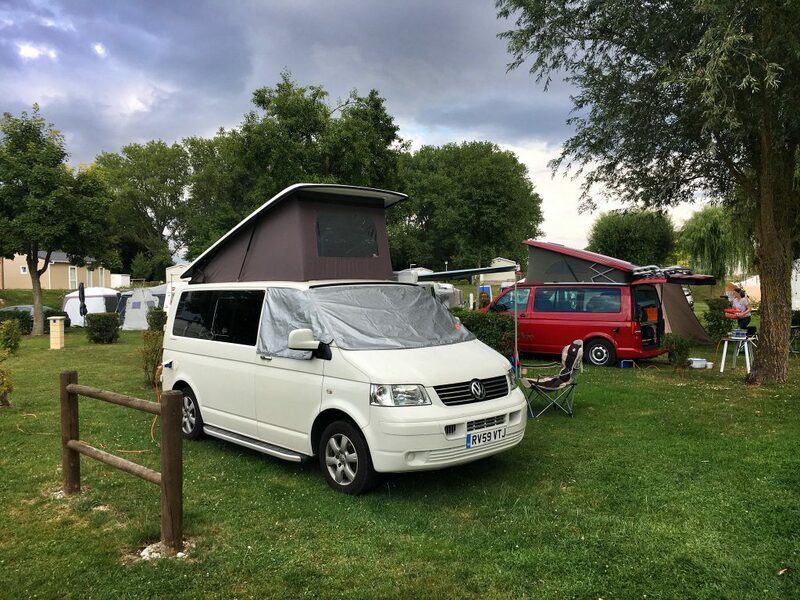 The last campsite before the drive home, Camping Au Bord de L’Aisne borders the river Aisne. 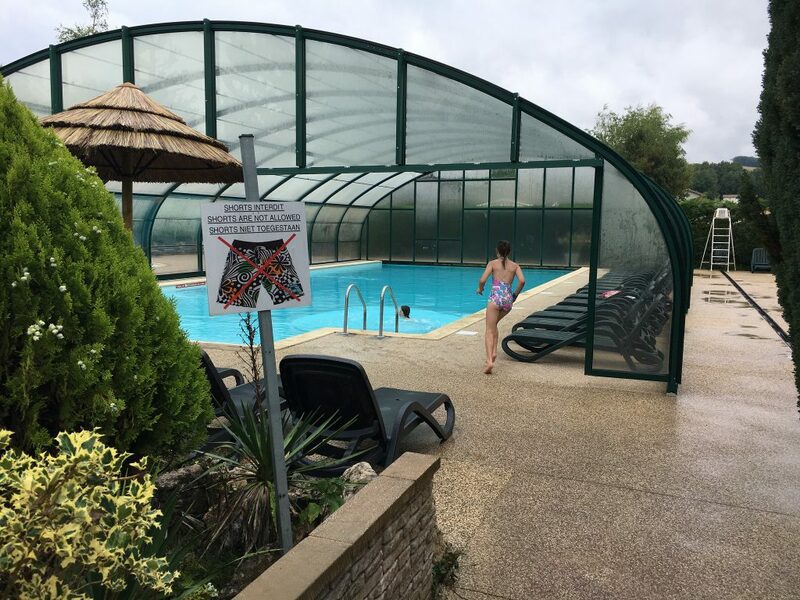 Guignicourt is within walking distance and Reims is a short drive away. 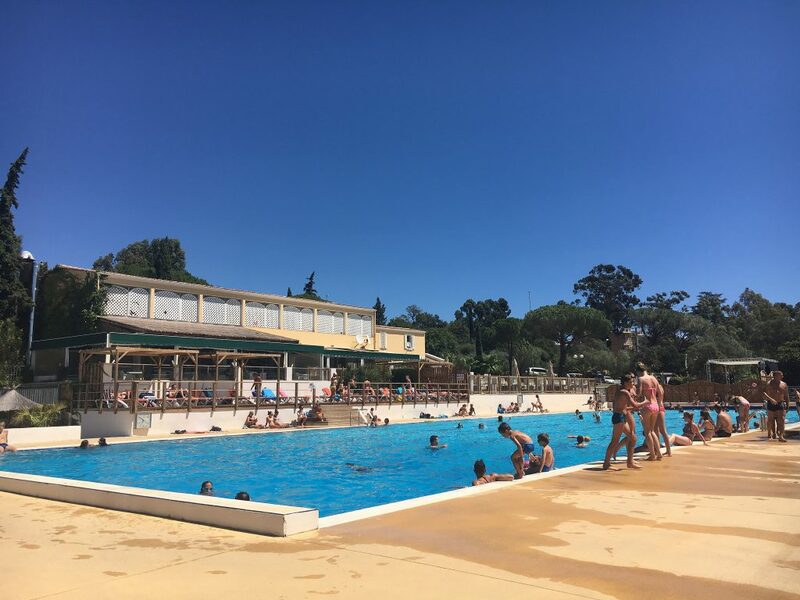 We didn’t need to venture away from the site with a pool and on-site take away. 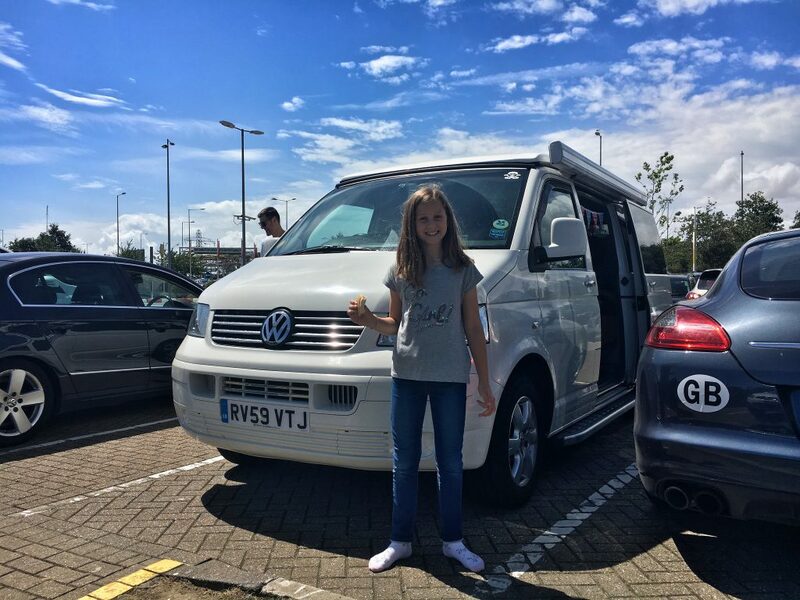 Making it back to the Eurotunnel is where we end our adventure with a total of 2,200 miles and 7 campsites under our belt. Will we do it again … Yes! I’ll leave you with a few captures from the dashcam for a flavour of the trip. We have a 16 month old and 2 dogs how long did you go for ? Thanks Aaron, we took about 2 and a half weeks – it was at a very leisurely pace! One full week at the destination. 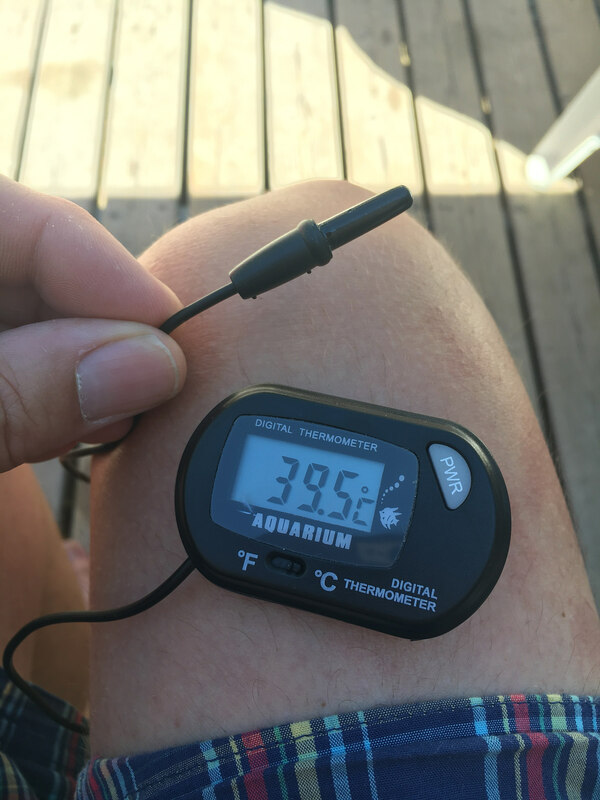 It does get hot though so you’ll need to consider that into the journey if you don’t have aircon with your child and dogs.